Tower was first published in March 1973. 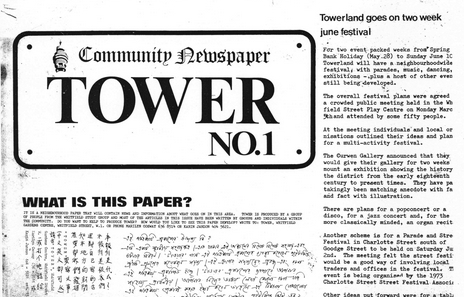 It was 40 years ago last month that Tower, a community newspaper produced entirely by volunteers, rolled off the presses and was delivered to homes in a central London neighbourhood. This year we are celebrating by making them available to view online in our own community newspaper archive. Tower was published every month from a flat just off London’s Tottenham Court Road in an area that is now called Fitzrovia . The monthly production was exhausting for all involved and it later came out every two months. After another transformation it became Fitzrovia News which is still published today every three months. What didn’t change was the writers’ commitment to raising awareness of issues affecting the residents living in this inner city neighbourhood such as housing and planning. But the paper also dug into the history of the area, profiled its people and gave the area a sense of community identity — something it proudly continues to do 40 years later. Fitzrovia Community Newspaper Archive is a project of the Fitzrovia Neighbourhood Association (registered charity 1111649). A version of this article also appeared on the Community Channel.